QUEBEC CITY — It’s hard to go wrong with a convention held in a region whose signature dish is sugar pie. But the final night’s award ceremony was all the sweeter for the success The Leaven saw across a broad range of categories, in both old media and new. 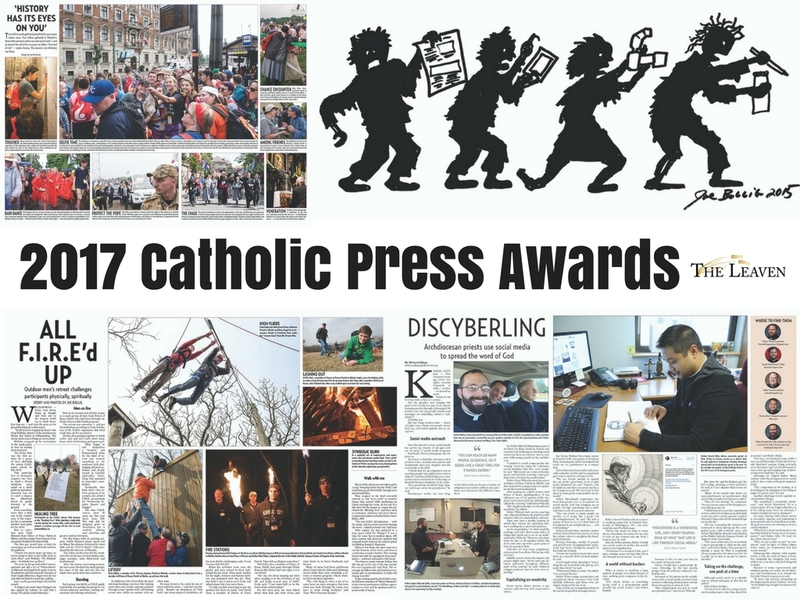 The archdiocesan newspaper won a total of 13 Catholic Press Association awards at its annual convention in Quebec City, June 20-24, and an additional second place in the Knights of Columbus Father Michael J. McGivney Award for Distinguished Journalism. The Leaven veterans acquitted themselves well at this year’s convention, and then the young’uns took it one better. But let’s start with the veterans. Quite a personality himself, it seems fitting that veteran senior writer Joe Bollig should win a second-place reporting award in the Personality Profile category for capturing so well the nurturing personality of Holy Name School’s longtime lunch lady Mary Lou Reyes. He then, in perhaps the only such writing/photography feat of the night, took third place in portrait photography for his photo of Army veteran and former B-17 bomber pilot Emerson H. Shields, an assignment that took him aboard a brief flight on one of those old warhorses in Topeka. Finally, veteran Topeka freelancers Marc and Julie Anderson brought home a first-place win in the Best Reporting on Children and Teens category for their piece “Musical Work of Mercy.” If you missed it, I’ll say only that you need to go find it and read it. It made the editors cry. But the real winners of this year’s competition, it seemed, were the 20-somethings. Famous for pressing into service any talent the Spirit throws our way, The Leaven sent former intern Katie Hyde and freelance photographer Joe McSorley with the archdiocesan group to Poland last summer, where the 22-year-olds documented World Youth Day 2016 with Pope Francis. Out of that coverage came two wins — a second place for Best Coverage of World Youth Day for both of them, and a third place for Best Multiple Picture Package for McSorley. Not to be outdone, Moira Cullings clocked in with three victories written at the ripe old age of 23, the first of which was a second place in Best Reporting on Vocations for “Discyberling,” a story about priests of the archdiocese who use social media to keep in touch with their flock. Finally, Cullings gave an assist to freelance photographer Jay Soldner, who won a second place in the Best Photo Story category for his photo essay called “Most Likely to Succeed.” The two spent the day with Angelica Perez, a student at Donnelly College in Kansas City, Kansas. Soldner, who is fairly new to The Leaven rotation but from whom you’ve seen some outstanding work this past year, also won a second place for Best Multiple Picture Package – Sports for “Sweet Victory” — a photo essay that documented the 2016 victory of the archdiocesan team in the Pitching for Priests game against the sluggers of the Diocese of Kansas City–St. Joseph. Two group wins topped off the evening. The first — a second- place win for Best Blog written by the regular staff, Esfeld, and advertising coordinator Beth Blankenship — we owe to winter intern Elizabeth Hyde, who encouraged us to enter it. The second place for General Excellence, however, is our pride and joy. Remember, The Leaven’s 16-page weekly is up against the big boys in this category, and it’s an honor to come home with anything, much less second place. But the best way to help us celebrate our Catholic Press wins is simple. Send us more of your prize-winning story ideas. And help us spread His story, by sharing yours.